WHB consequences for behavioral issues consist of O.S.S, I.S.S, suspension, and expulsion; but what if there is a better way to discipline students instead of immediate punishment? West Baltimore school district located in Baltimore, Maryland has found a more efficient way instead of punishing violent students. In response to misbehaving children; at West Baltimore High, they are sent to meditation rooms with licensed instructors .,to relieve stress and anger. Kids are punished for making bad choices and acting out even though the reasoning behind it may be stress, mental health issues, or even just a bad day. As said by most teenagers, high school can be stressful from time to time and sometimes kids don’t know how to release their feelings other than with violent actions or bad decisions. 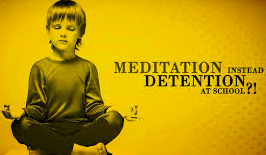 West Baltimore High statistics have shown that meditation instead of punishment has been said to improve behavior as there have been less referrals and zero suspension in response. However, parents are not happy with this change as they feel violent kids should repay for their actions. Overwhelmed with school work, irritated students should not be penalized by make bad decisions in response to a difficult time. The only exception should be if the student makes a really bad decision in which then strict punishment should be enforced.